Taco Bell is serving breakfast? I admire this guy for taking one for the team, but I don’t want to imagine the gastaric distress he must have undergone. Not to mention the years he probably took of his life! So, what constitutes a mid-life crisis? For the record, I was the one that named this endeavour. (Actually, what I suggested was “Mid-Life Crisis Action Committee”, but Rando suggested we shorten it to our current moniker.) I came up with it mainly as a joke; we were, after all, three friends in our early 40’s who decided to take a stab at podcasting. All of us were regular guys (as much as anyone can be called “regular” anyway). We were all married, all working 40 hour days, and we were all getting older. Starting a podcast seemed like a mid-life crisis to me! A rather turblent year kater and and I’m looking at things differently. Soon after we got this podcast/blog going, I lost my job. It was a job I didn’t like and was glad to see the back side of, but losing it stung nonetheless. Less than six months prior, I’d gotten a large and long overdue raise. To say I was not expecting to be out work before that same year was out was an understatement. So, there I was. Forty-two years old and sitting at home all day, drawing unemployment, trying to dwell on the list of trips and purchases I’d planned to make that were now postponed indefinitely, and marveling at just how much cats sleep during the day. My main occupation was trying not to go stir crazy while looking for work in a tight job market. Eventually, I was offered a job I really didn’t want. I took it anyway, cause it was tired of making my wife pay for everything. It was a job and I took it despite my reservations. I lasted one day and never went back. Soon afterward, I lost my unemployment benefits due to changes in my state’s regulations. After a very nervous week of hunting for something, anyway, I found a part-time gig at the local movie theater. My first job at age 18 was in my hometown’s theater. Now, twenty-four years later, here I was again. I tried hard not to let my siuation get me down. Other folks were a lot worse off than I was. Sometimes when a member of a very successful group releases a solo album, it runs the risk of being proportionally as good or proportionally as bad as the group’s work. 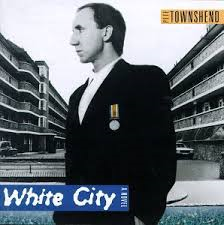 This is not the case with White City: A Novel by Pete Townshend. It is a surprisingly solid record all the way through. With this album, Townshend gives us a glimpse of life in an area of London where he had grown up. All the songs are sung by Townshend and he provides a couple of high spots with “Brilliant Blues” and “Hiding Out”. I believe the only song that got any radio play during its release was “Face The Face”. This is one of those you either hate it or love it songs. The song is catchy in an embarrassing kind of way, but as far as serious writing, it is a throwaway song. There is also a corresponding film that was released with this. I have never seen it, but I would be interested in watching it. This album can be labeled with the dreaded moniker of “concept album”. I know that phrase makes some cringe, but don’t be worried. If you are looking for a solid rock album with some catchy tunes and some really good music, this is the album for you. The songs can stand on their own and there is no comparison to the music of The Who. Townshend was always the driving force behind the lyrics anyway and he shows on this album that he hasn’t lost his touch. It is an older Townshend reflecting on his past. There might not be an anthem like “Won’t get Fooled Again” on this, but there doesn’t need to be. It is a really good album from an artist, who at the time, was starting to change his direction of songwriting. Give it a chance and I am sure you will find it is worth a listen. Maybe I am feeling sentimental today or maybe it is the thoughts of Spring slowly creeping its way in that’s got me thinking of the past. The change of the seasons has always made me a bit moody and this year is no exception. I don’t want to go into this diatribe on how better things were when I was younger. I have never subscribed to that. I saw enough of that attitude with my father and it really annoyed me. His life was a series of clips from the past that made him feel old and unwanted. The actual truth of the matter was that he hated being old and he would rather live in the days gone by than in the present. It was hard on everyone around me. I don’t want to be that person. I don’t think I am. It makes no sense to mourn the past at the cost of your present. You get nowhere with that attitude. All that being said, I do long for a few things. I do long for the free time I had as a kid and teenager. I do miss my imagination. It was my best friend as a kid. We have long since parted ways and the thought of that does make me a little sad. I miss my mom. We were just getting to know each other when she died. I don’t mean in a sense that she was missing in my life, just that I was finally out-growing that obnoxious high school demeanor and trying to find my way and appreciating my family. We were talking and caring about each other as adults. She was taken way too soon. I miss that innocence of a child. It is hard for me not to look at things with Cynic-colored glasses anymore. I do miss when all of my friends stood as one. Time and attitude has changed that and the less said about that part the better. I know who my close friends really are and I am grateful for them. I don’t want this to turn into this sad, “I hate my life” type of rant. I don’t hate my life. I am in a rut at the moment, but I am better off in a lot of ways than I was as a kid. I am not this emotional train wreck that limps along feeling sorry for himself. I just would like for me to have more control over me. Time and age may change your body, but it shouldn’t change your attitude. I might be growing older, but I am not growing up and I personally like it that way. I just find it harder to recapture that feeling of youth, but it is out there, just waiting for me to slip it on like an old favorite sweater. The sweater might be worn and faded because of time, but it does keep you just as warm and makes you feel as good as it always has. The thing is, you have to hunt a little harder in the closet to find it.